We would love to have you at the 2019 career expo. The 2019 career expo will be held on the 1st of March 2019. The Tsogo Alumni Society would humbly like to invite You/Your Organisation to come and present at our Tenth Annual Careers Expo to be held on Friday 1 March 2019 at the school in Mmakau village. The event will be attended by some former students, current learners, teachers, company and university representatives and some members of the community. We request that you or anyone from your organisation be one of our presenters at the March 1st 2019 event. The presentation could cover information about your organization and programmes, and more. It would be interesting to get Tsogo learners to learn about your Entrepreneurial Development, Mentorship, Scholarships and other programmes. 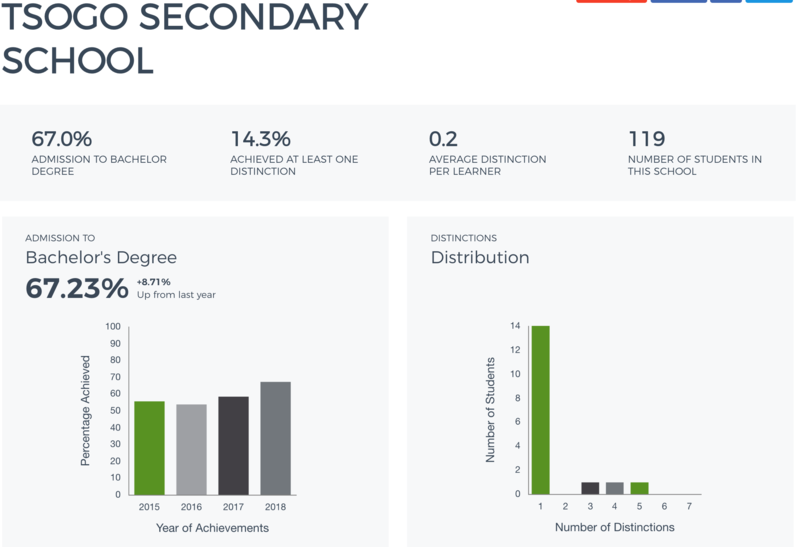 The aim of the presentations is to inform current Grade 9 to 12 learners about various career choices, tertiary institution programmes and courses ,bursary and funding options, alternative choices (such as entrepreneurship) and offer them general career guidance. Representatives of each organisation or institution will be allocated a stand which will be visited by small groups of learners during the course of the Expo. Interactions with learners may be in the form of a presentation followed by formal and informal question and answer sessions. We will provide you with more details about the day’s programme well ahead of the event so you are aware of your time slot should you wish to join us. Many thanks for your consideration on this matter and we wait to hear from you. If you or your organisation/company/business are interested in participating, please fill in the short form linked below to confirm attendance. The funds to cover the event are a joint expense between the Alumni Society and the School. As such we encourage alumni to donate towards the event and also let us know of any other types of sponsorship they might be able to provide. Final budget information will be available soon. You can view our donation details on our fundraising page http://tsogoalumni.org.za/society/fundraising. On 6th December 2017, the Alumni Society handed over a cheque for R185,000 to the school – being the proceeds from the 1st Annual Tsogo Alumni Fundraising Golf Day. The funds will be used to fully renovate the learners’ toilets, starting in January 2018. 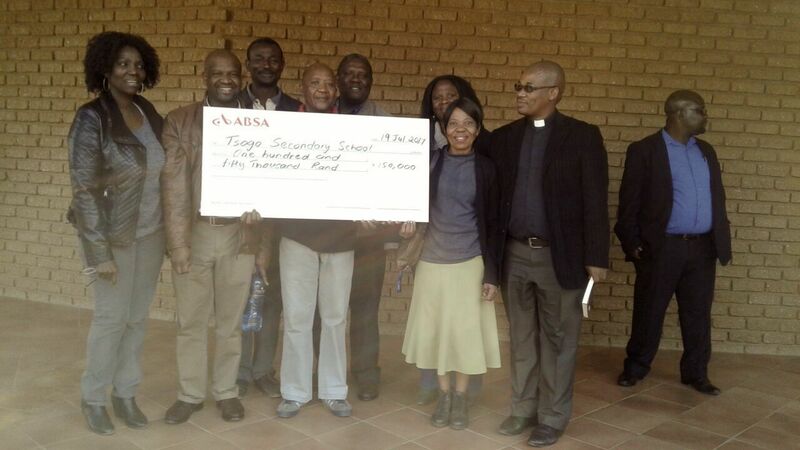 Society Vice President, Moshabi Pitsoane, handing over the proceeds to Mr. Malemane. Is our pleasure as the school management and staff including SGB to update Tsogo Alumni society regarding the school progress for 2017. The school has received an amount of R296 730.00 from National Lotteries Commission ( NLC) to renovate and upgrade the sport field with Tennis court , Volley ball court /Netball court) known as (combo court) and purchase sport equipment and uniform for those mentioned sport field at the amount of R50 000. The project will start during October/November 2017. The school has received an amount of R150 000.00 from Motsepe Foundation to erect assembly port the said project will kick start in October/November 2017. The school in partnership with Tshikululu social investment celebrated Mandela Day on the 18th July 2017. The said company did the following project for the school. Donated 10 desk top computers for the computer centre and renovated the roof and ceiling. Revamping of the school library, painting, bought 12 chairs and linked the school with School aid foundation for the donation of books which we expect next year 2018 and registered the school with FUNDAZA MZANTSI for library club for learners. Donated shelves for the different offices and staff room for storage of files and books. Requested to be involved in the career expo for 2018. Old mutual has confirmed a donation of R20 000.00 with the money we plan to put up car ports for teachers. It will start December 2017/January 2018. An extra R 5000 to be donation for the library. We have a promise from Hernie mine to renovate or put up a set of new toilets for our learners, they plan to spend + or – R 500 000.00 on the project, it will start either before December 2017 or January 2018. As an alumnus you can support our fundraising efforts, as we join forces with the school, see our Fundraising page to assist in our efforts as Alumni! This is a submission to the 2016 Tsogo Alumni Society Essay Competition. The essay is the learners work and has gone through some minimal editing for presentation. Title: Is there such a thing as “free education”? Could this “free education” be achieved by non-fee paying schools (like Tsogo Secondary) and “free” higher education as espoused by the #FeesMustFall movement? “Education is the great engine of personal development. It is through education that the daughter of a peasant can become a doctor, that the son of a mineworker can become the head of the mine and that a child of a farmworker can become the president of a great nation. It is what we make out of what we have, not what we are given, that separates one person from another” these are the words of the late President Nelson Mandela. Education, a vital tool that one can possess in life.